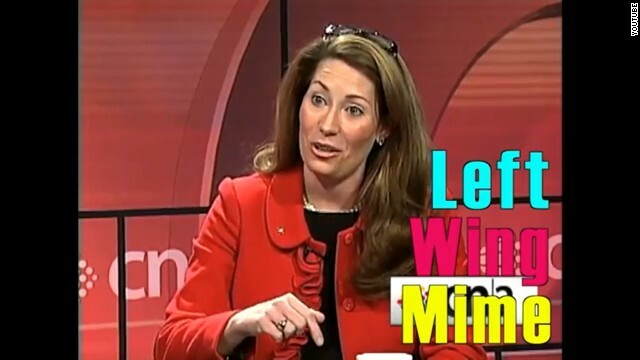 Sen. Mitch McConnell released a video Tuesday bashing Democrat Alison Lundergan Grimes. (CNN) - It's game on in Kentucky, in what could end up being the most expensive and nasty 2014 Senate race in the country. One day after Kentucky Secretary of State Alison Lundergan Grimes, who many in the Democratic party consider their best hope to unseat Senate Republican Leader Mitch McConnell in next year's midterm elections, announced that she'll challenge the longtime GOP senator, and the emails from both sides are flying. "Alison Lundergan Grimes stood proudly at the Democratic National Convention to nominate Barack Obama, who is now following through on his 2008 promise to destroy the coal industry in essence declaring a war on the state of Kentucky and the middle class families who call it home," declared National Republican Senatorial Committee Communications Director Brad Dayspring, in an email Tuesday morning. It's part of a strategy by national Republicans and the McConnell campaign to tie Grimes to President Barack Obama, who lost Kentucky by 23 percentage points in last November's election. "The fact that Mitch McConnell chooses to play politics on behalf of special interests while allowing student loan rates to double on more than 123,000 Kentucky students is exactly the kind of dysfunction and partisanship that's earned him the title of least popular Senate incumbent in the country," responded Justin Barasky, a spokesman at the Democratic Senatorial Campaign Committee, in an email to reporters a few hours later. His email also described the five-term McConnell as "the walking, talking embodiment of everything that's wrong with Washington." The Democrats strategy is just as clear as their Republican counterparts. They want to make this contest all about Mitch McConnell and his three decades in the nation's capital. "If the race is about Barack Obama, we lose. But Democrats will have the resources to make this a race about McConnell, and if it is, we win," says a Democratic strategist with experience in Kentucky, who asked for anonymity to speak more freely. Starting in March, when actress and activist Ashley Judd announced that she would not challenge McConnell, Grimes came under pressure to announce her intentions one way or another, with some national Democrats touting her as a top potential candidate. Grimes, 34, a Lexington attorney who cruised to victory in 2011 as Kentucky secretary of state, is the daughter of a former Kentucky Democratic party chairman with close ties to former President Bill Clinton. Even before she announced her candidacy Monday, Grimes had already come under attack, both by an internet ad put out by the McConnell campaign that poked fun at the amount of time she was taking to make a decision, and by a pro-McConnell independent group that went up with an ad that called her "Obama's cheerleader in Kentucky." McConnell, 71, is infamous for taking the attack to his political opponents, and he quickly welcomed Grimes to the race by linking her to the president. "Accepting the invitation from countless Washington liberals to become President Obama's Kentucky candidate was a courageous decision by Alison Lundergan Grimes and I look forward to a respectful exchange of ideas," said McConnell in a statement. And there was a similar message from the NRSC. "Kentuckians have absolutely no reason to send Alison Lundergan Grimes to Washington to help pass the policies of a President whom they adamantly oppose and to elect a liberal Senate Leader who declared, 'coal makes us sick,'" said NRSC Executive Director Rob Collins. "She worked to put him in office. She worked to get him re-elected. You can't de-link the two," a Republican source with knowledge of Bluegrass politics told CNN. A top Grimes adviser says that strategy won't work. "Anyone who knows Alison Lundergan Grimes knows that she's her own person. I don't think that Sen. McConnell's trickery will work. Kentucky voters won't buy into those false attacks," Jonathan Hurst, a senior Grimes political adviser, told CNN. Republicans also attacked Grimes for her Monday announcement. The subject line of Dayspring's daily morning email from the NRSC was "Worst Launch Ever." And McConnell campaign manager Jesse Benton added that "we hate to see someone flounder so badly, so we decided to give Alison a helping hand," in an email premiering a web video that mocked Grimes announcement. Democrats were quick to point out that the McConnell video misspelled the senator's name. The McConnell campaign said the spelling was just as quickly corrected. The Grimes campaign says Monday's announcement was not a rollout. "Yesterday Alison was simply announcing her intentions to run. I'm certain when we do our rollout, you will see that this will be a top tier campaign and we will have the most professional organization in the state," responded Hurst. In his five Senate elections, McConnell has only once topped 55% of the vote, and Democrats, touting polls that suggest a close contest, consider McConnell vulnerable. But he has a large war chest, with $8.6 million cash on hand at last check. McConnell raised $20 million for his 2008 re-election, a cash haul that he's expected to top this time around. The Democratic strategist says Grimes and her allies can stay competitive when it comes to the battle for campaign cash: "You cannot overestimate the desire among Democrats to defeat McConnell. There is nothing that unites Democrats more than wanting to beat McConnell. He's sitting on a mountain of money, and I'm sure he's going to raise millions more, but McConnell's going to need it because Democrats are going to have the resources to take him out." The ad wars in the race started even before McConnell had an opponent. Pro-Democratic groups already went up with ads earlier this spring against McConnell. Two weeks ago Senate Majority PAC and Patriot Majority USA announced they were spending $250,000 to go up with TV, radio and digital ads, as well as a new website, to argue that McConnell's been in office too long and that "it's time for a switch." "Our strategy remains to highlight how after 30 years in Congress, McConnell is out of touch with Kentuckians and he is the symbol of everything that is wrong with Washington," says a source with knowledge of the group's plans. "We plan to continue our campaign using all the tools necessary (paid media, digital media, social media, web presences, etc) between now and the election to hold him accountable." But the Republican source from Kentucky says that strategy won't work against McConnell. "He's very different from these other senators who in years past were labeled as too Washington. He goes back to Kentucky every weekend. He knows all the state senators and he knows the party leaders. McConnell is the guy who built Kentucky politics into what it is today." "There's a reason so many Democrats said no to running against McConnell. He's got universal name ID in the state," added the source. McConnell's also aired TV commercials. It's extremely rare for an incumbent to go up with spots so early in a campaign cycle, and Grimes charges that McConnell's ads "are based out of fear of losing his 30 year grip on power." There's a little bit of history that's working in McConnell's favor: Kentucky hasn't sent a Democrat to the U.S. Senate since 1992, when Wendell Ford won re-election. Next year the Democrats will be defending their slim majority in the Senate. They currently hold a 54-46 edge (including two independents who caucus with the party) over the GOP, which they hope to expand to 55-45 following October's special Senate election in New Jersey. But they will be defending 21 of the 35 seats up for grabs in 2014. Kentucky may be one of the few contests where Democrats hope to go offense. "The Kentucky Senate race might be the most expensive in the country but that doesn't mean it's the most important. There are at least a half-dozen other Senate races that are more competitive and will decide the majority, but Kentucky will probably make the most headlines," says Nathan Gonzales, political editor at the non-partisan Rothenberg Political Report. "With the minority leader, a female officeholder, and tens of millions of dollars, the foundation is set for an ugly race in Kentucky," adds Gonzales. McConnell will successfully tie Grimes to Obama. He's anti-Legacy Energy, and he's black - not who you want to be tied to in Kentucky. Grimy Lawyer Grimes must have some dirt that needs digging up.... All lawyers are thieves. "Sen. McConnell had made a motion for the vote on legislation that would let the president extend the country's borrowing limit on his own. Congress would then have the option to disapprove such hikes, in a fashion similar to one that McConnell first suggested during last year's standoff over the debt ceiling." In effect, McConnell had proposed a perpetual debt ceiling grant for the POTUS. The idea was to give Pres. Obama rope to overreach, to make him look like the picture the right wing paints of him. Sen. Reid rejected the idea, had lunch, and called for an up or down vote on it. Suddenly, it was an up or down vote to raise the debt ceiling. What is telling is that no other Republicans came to McConnell's defense and filibuster for him. He had dug his own hole, and his colleagues made him lie in it. What does the GOP fear most (besides minorities and gays)? Smart women (aka, Deomocrat women). Want evidence? Simply tune in to Fox News and watch their merry band of female idiots, Carlson, Malkin, Coulter, Ingram, etc. Or, look at the women they run for poliitical positions, Palin, Angle, Bachmann, Brewer, etc. Facts don't lie. She should mop the floor with this failed GOP garbage of America party loser!!!!! 2014 is a bad time for a Democrat to run against a Republican, just after the electorate has found out just what is in Nancy's bill and how much it will cost. Obamacare, as Max Baucus was intent on doing until he suddenly decided to retire. But that will poison the well for Democrats. Its interesting to hear all the righties on here assuming they are going to run the tables. I recall a similar level of over-confidence on the part of the GOP about 2 years ago, when it was assumed they would win in states like IN, MO and SD: how did that turn out again? McConnell has to justify over 3 decades of inaction, as opposed to Democratic incumbants who have tried to move the country forward. Will it be easy, in a state where Democrats have not won a Senate seat in over 2 decades? No, but the fact that McConnell ran attack ads against people who had not even announced reveals a man desperate to keep his job. He may win, but he will use up resources and will be unable to help GOP candidates anywhere else. The man who is the symbol of GOP inaction and obstructionism won't be a welcome sight to an independent voter in any state, including the Red states, desperate to see something positive coming out of Washington. Sorry, but Justice Roberts found Obamacare constitutional, so its a moot point. There is no one thing for the GOP to rally around, not after the way they have fractured themselves over the last 3 years. Theya re fractured even on teh NSA spying. Boehner can't get anything done, and McConnell has no signature accomplishment after 3 decades of saying no to anything except subsidies for the coal industry. This year will be fought at the local level, not national, so it boils down to what have they done for us lately, or, in Mitch's case, ever? He's just a big nanny!